Music Crowdinvesting – Where Are the Brave Music Entrepreneurs? 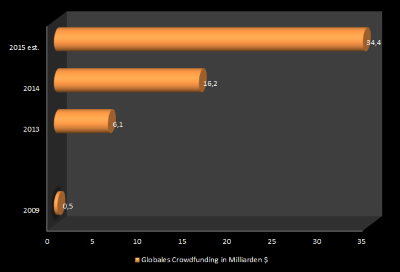 A look at the most recent massolution Crowdfunding Industry Report 2015 shows amazing growth rates in crowdfunding over the last several years. Starting with a market volume of 0.5 billion $ in 2009, the amount reached through crowdfunding was estimated at 34.4 billion $ for 2015. At the end of this development, there could be a crowdfunding market with a volume of approx. 300 billion $. At least, that is what the VC investor Fred Wilson had to say in 2012 about the future of the start-up scene within the USA. Let us project that globally – what a wonderful world! Unfortunately, the music economy has neither profited from the development of the crowdfunding market since then – the worldwide music funding share for 2014 only reached 736 million $ or 4.5 % – nor is it foreseeable as to whether or not established or new players within the music industry will resolutely approach the idea of crowdfunding or even the idea of crowdinvesting. This is where we need labels, music producers or even crowdfunding savvy (private) investors. The potential is huge. If you take the music crowdfunding share and extrapolate it to the forecasted market volume from Fred Wilson, then we are looking at a sum of 13.5 billion $. The models are there, the shortage is in the platforms upon which such ideas could be put into practice. The former Sellaband (unfortunately, no longer active) had approaches on how to allow fans to profit from the earnings of an artist on the long-term. It is sad to say, but the idea of Sellaband can be seen as a failed one. There is, however, a new player who is trying his hand with the idea – TapTape, from the USA, is offering the option to financially participate in the long-term success of an artist through TapCoins. Crucial to the success of crowdinvesting models is, as was always the case with crowdfunding, the trust of the fans or supporters/investors. This is where all of the parties – labels, producers, platforms, artists – have to make sure that this trust can be maintained and further solidified. Realistic forecasts pertaining to the earning potential and clarification concerning the risk of investment as well as 100% transparent communication also go hand-in-hand. Why should, what is already a common practice in the film industry, not be possible within the music industry? Platforms such as CINEDIME and the Stromberg project from Brainpool are leading the way. Let us follow their example. Advice to the topic? Send me an email at mario[at]musicandcrowdfunding.com.